Shaker furniture with a contemporary update is the style of Room 9. Lots of lace is also used to complete the decor. 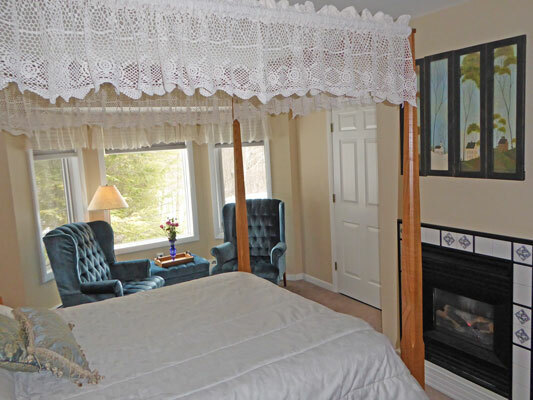 A graceful queen sized lace canopy bed invites you into Room 9. The bed, and it's companion side tables, is finished in a beautiful honey oak for a clean and crisp appearance. The bed is old fashioned in construction. Step stools are provided on both sides to assist you up to the bed. As you enter the room to your left you will find an oak dressing chest. 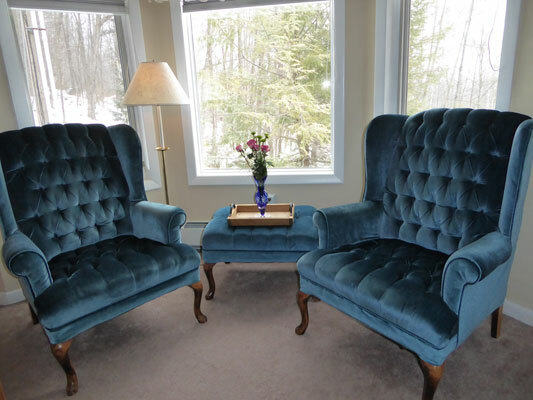 In front of you, in the bay window, you will find 2 very comfortable high back easy chairs. They provide the perfect spot for quiet relaxation. The bay window overlooks the Covered Carriageway and gardens. Mountain tops across the Roaring Brook Valley can be seen in the distance. Room 9 also features a large bathroom that is equipped with a corner whirlpool tub for 2 . The tub also has an integral shower. Crystal lamps complete the bathroom. Between the lace, some champagne from the Great Room, and the hot, bubbling whirlpool.......what could be better! 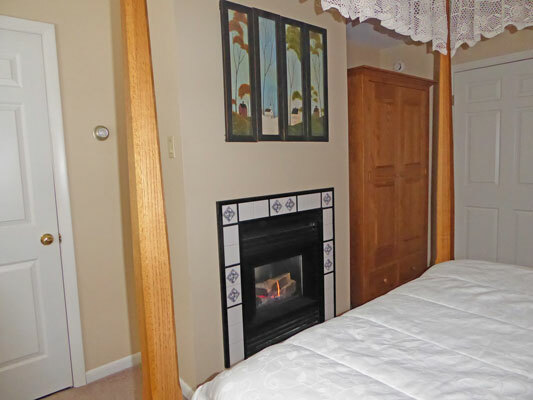 After your whirlpool, you will also find a fireplace at the foot of the bed in Room 9. A set of Warren Kimbal prints are used to complement the decor. Warren is a local Vermont artist from Brandon. His gallery is a great side adventure from the Birch Ridge Inn. To complete Room 9, a spacious armoire in an alcove beside the fireplace is provided as the room's closet. Room 9 is also air conditioned for the summer months. Of course, as all of our guest rooms, Room 9 is also equipped with WiFi internet access, an alarm clock with usb charger, and HD television. The television is completely hidden from view when you enter . Your entire visit could be spent without even knowing that it is there. Between the whirlpool, the fireplace, the bay window and the lace bed, who has time for TV anyway. Our Room Rate Calculator can help you plan your stay at the Shaker with Lace Room at Birch Ridge.